Ninja Saga Cheat Instant Mission Hack. 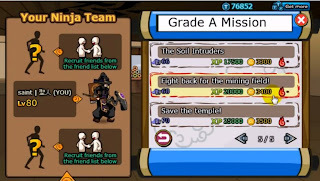 If you want your ninja character level up quickly or just leveling your pet...use this Ninja Saga Cheat Instant Mission Hack. You simply enter mission grade A or B level 20-78 and then click on the mission you'll complete the mission instantly. This hack using fiddler. Drag swf file to Auto responder table. Go to mission grade A or B level 20-78 and execute the mission that you like, then the mission will be instantly completed.